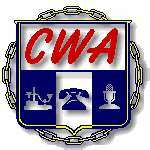 The Communications Workers of America (CWA) is an American union for workers in the communications industries. It is a member organization of the AFL-CIO. Communications Workers of America (CWA), Washington DC - Tony Daley. This page was last modified on 26 August 2018, at 00:07.